Press conference held after the verdict. In anticipation of more cases, Japan National Railways announced the launch in April 2009 of a scheme to pay a 10 million yen ($108,366) lump sum to the families of other railway workers who had died from asbestos-related disease. The landmark decision came 23 months after Mai Omae, Mr. Kato's grieving daughter, brought Japan's first asbestos case against the formerly nationalized railway company.3 Mr. Kato, who worked as an electrician at Ofuna Factory, Kanagawa prefecture from 1953-1987, inspected and repaired railway carriages during the course of which he was exposed to asbestos-containing fire-proofing products. He was given no warnings about the asbestos hazard and had never been issued protective equipment or clothing to minimize his exposure to the dangerous dust. He died in 2004. Mr. Kobayashi, the other mesothelioma plaintiff, worked in the railway yard as a flag man, leading freight trains into the yard. 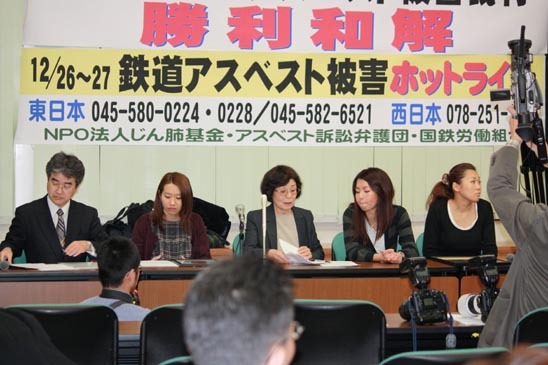 The Pneumoconiosis and Asbestos Victims' Relief Fund, the Kanagawa branch of Japan's National Railway Workers' Union (NRU-KOKURO) and the Kanagawa Occupational Safety and Health Centre (KOSHC) were supportive of the legal struggle by the workers' families to obtain justice. Joint actions were mounted by these groups to raise the public profile of this case through media coverage and public demonstrations. 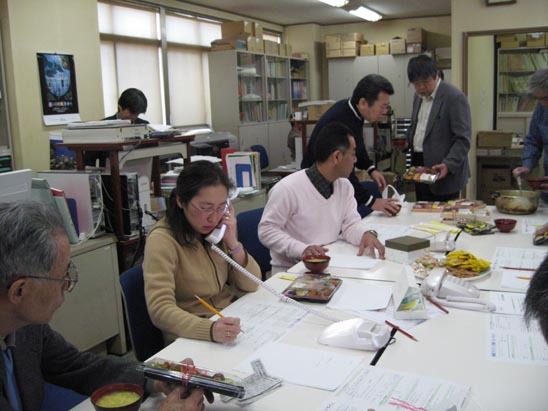 After the ruling was made public, a telephone hotline was set up to take calls on December 26-27 from railway workers or family members of those who think their relatives might have contracted asbestos-related diseases from working on the railways. 1 The compensation will be paid by the Japanese government which ran the national railways when the victims were exposed to asbestos. 2 Bereaved Families of 2 ex-JNR workers settle Asbestos Suit. Mainichi Japan. December 26, 2008. 3 Kazan-Allen L. Asbestos Test Case Against Japan Railways.